floatingsheep: Swine flu: a user-generated pandemic? Swine flu: a user-generated pandemic? In a recent post at 538.com, Nate Silver delves into mapping the spatio-temporal diffusion of swine flu in the US, via Google Flu Trends. Drawing from queries referencing swine flu, the map below shows the approximate date at which state-wide searches for "swine flu" crossed a particular threshold, potentially signifying the onset of what has become a swine flu pandemic. According to Silver, the date at which the relative number of searches reaches the indexed value of 5000 serves as a proxy for measuring the diffusion of the year's most talked about genetic mix-up. So we know when and where people were looking for information about swine flu, but what about geo-references to the virus? How does the geography of swine flu differ between Google Flu Trends and user-generated Google Maps placemarks? How do Google's multiple representations compare to the actual number of cases of swine flu in the United States? Although the CDC has stopped collecting data on the outbreak of swine flu on a state-by-state basis, the regional-level data in the map above shows the concentration of swine flu cases. The upper Midwest, for example, which has the highest number of swine flu infections in the country, only recently surpassed the 5000 point mark on Google Flu Trends. Clearly the act of searching for information on swine flu need not closely correspond to the number of cases. And while this region shows significant clustering in user-generated Google Maps placemarks, the values fail to approach the maximums for the nation as a whole. The peer produced geography of swine flu also seems to support CDC statistics for the southeastern US (showing a relatively high infection rate), while the Flu Trends data fails to match accordingly both there and along the US-Mexico border. 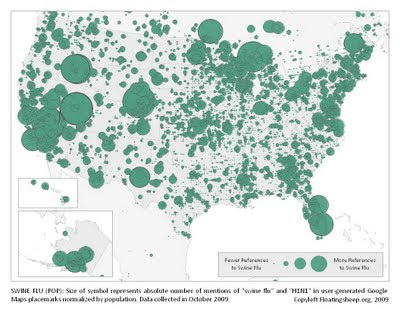 The population-adjusted map does, however, give a much clearer picture of the swine flu landscape in the US. Both the west coast and upper midwest, despite having the highest incidence of swine flu in the country, were previously overshadowed by the population centers of the east coast. Normalized by population, the placemark density comes to mirror much more closely the actual diffusion of swine flu across the country. 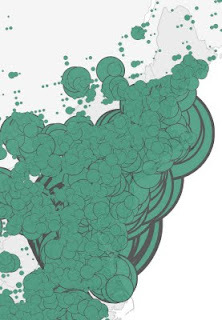 I would try to add a map of media-generated swine-flu content. I'm thinking these trends suggest that the "Google Flu Trends" is driven more by hype than reality. I wonder how you got all these information. what is the current count?